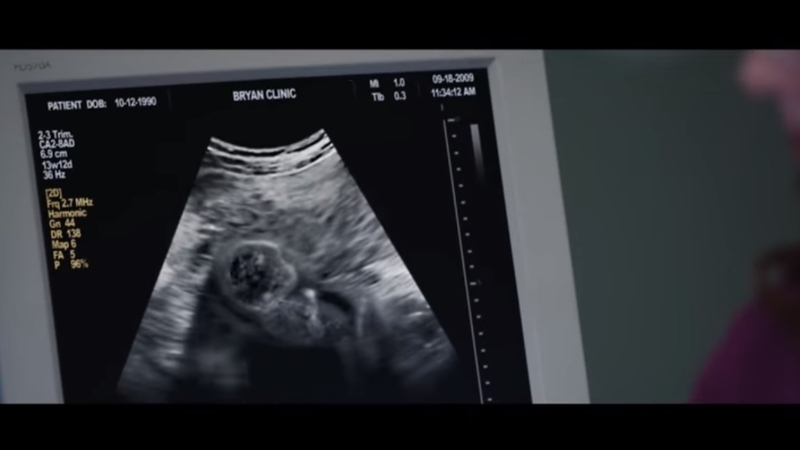 This screenshot of a clip from "Unplanned" portrays through computer-generated imagery the ultrasound of the fetus that Abby Johnson saw die. A report in "The New York Times" on the film questioned the scientific validity of this scene. The question: was the 13-week-old fetus Abby Johnson saw through ultrasound capable of recoiling from an abortion instrument? Could the unborn child have been fighting for its life? Did that key moment in her life really happen that way? The New York Times says probably not. The newspaper quotes a “fellow with the nonpartisan American College of Obstetricians and Gynecologists” who calls the idea that the fetus would fight for its life “misleading.” The newspaper says Jennifer Villavicencio performs ultrasound-guided abortions herself. Johnson said the child looked like it was fighting for its life. But Villavicencio said that’s not possible and misleading. So which is it? Abby Johnson’s publicist provided The Stream with a response from Colleen Malloy. A board-certified pediatrician and neonatologist, she cares for premature babies, some of whom are born as early as 22 weeks. If a twin at 13 weeks gestation can react to her twin’s touch, couldn’t she also react to an abortion instrument’s touch? How do we know what the fetus feels? They can’t tell us about their pain. Malloy explains that doctors use “anatomical, physiological, and behavioral markers associated with pain in order to conceptualize their pain experience.” For example, she said sensory receptors appear as early as 6 weeks in the face. They spread to the palms and soles of the feet by 11 weeks. By 12 weeks the receptors are connected to the spinal cord, and by 13-16 weeks, monoamine fibers are connected to the brain. In other words, there are important structures developing early on related to sensing touch. And what kind of response to touch are 13-week-old fetuses capable of? Malloy said at this age, they’ve been observed reacting to the touch of their twin. I think this example gives enough evidence to conclude that Johnson could have seen a 13-week-old fetus react to the touch of an abortion instrument. If a twin at 13 weeks gestation can react to her twin’s touch, couldn’t she also react to an abortion instrument’s touch? Whether the fetus knows the instrument is dangerous and has a fight or flight response is another question. But Johnson’s report of her experience makes perfect sense. And seeing the fetus sucked up as it was reacting to an abortion instrument? How heartbreaking. I tweeted at Villavicencio, the abortionist the NYT cited, and shared a brief exchange with her. You can see the whole exchange here. I wondered if she really believed that a 13-week old fetus can’t possibly recoil from an abortion instrument. She said “yes,” that’s what she really believes. When I followed up, it seems like the idea of the fetus perceiving danger is an important distinction for her in defining what we were talking about. Interestingly, according to Malloy’s earlier quote, a fetus at any age gestation cannot be aware of danger. But she said they can react to stimuli and they may have a kind of perception of pain. We don’t know exactly what they can feel, but we know that at 13 weeks they have sensory fibers that are connected to the brain. Villavicencio also said the Unplanned scene in question is “dramatized.” Well, technically, it is. 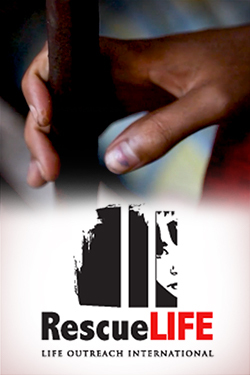 With dramatic music and computer-generated imagery. But that’s not to say that a real ultrasound of a 13-week-old fetus being sucked away — all the while able to respond to stimuli — wouldn’t be traumatic, or that it wouldn’t look like the baby is fighting for its life to someone like Abby Johnson. There’s a reason why abortionists don’t let mothers see their ultrasound during abortions. It might cause them deep pain and regret. At the end of the day, that’s what Johnson’s story is about. She saw a baby move in response to its abortion. A 13-week-old fetus can do that. Seeing that, she felt deep pain and regret. Was the baby “fighting for its life”? Not with awareness of danger, no. But seeing that little human’s movements and death changed Johnson’s life. In hindsight, the title, “Is what Abby saw scientifically possible” and the whole scientific focus misses something important. I believe Abby Johnson saw exactly what God wanted her to see. And with God, all things are possible. Based on my sources, the fetus wasn’t aware of danger — which I understand to mean — wasn’t consciously aware of the need to escape from danger. But all that thinking about what fetuses are capable of may lead us to think that, because they’re not conscious of their experiences in the same way we are, their lives are less important. The reality is that God opened Johnson’s eyes to see that there was a real fight for life going on. Whether the fetus knew it was fighting for its life, God knew. He knew what His child was facing, and it grieved His heart. And after years of prayer from loved ones, Johnson could see that too.